Understanding the potential for infrared sauna side effects is crucial to getting the most benefit out of your infrared sauna experience. As with any kind of sauna, there are potential side effects that can ruin your experience if you aren't careful. But avoiding them is easy if you know what you're doing and treat your sauna with the proper respect. One of the most common infrared sauna side effects is simply dehydration, which can lead to more serious problems if not addressed properly as soon as possible. Dehydration is the loss of too much of your body's store of water, usually the result of excessive sweating. While a good sweat is desirable when you're using a sauna, you do want to make sure you don't lose too much moisture. Children and the elderly are particularly susceptible to dehydration, so keep a close eye on them. To prevent dehydration, drink plenty of water before getting into your sauna. After your session is over, rehydrate with lots of water, fruit juice or a sports drink. Avoid drinking alcohol, as it can actually increase dehydration. Heat stroke is a more severe form of dehydration and is one of the potentially dangerous side effects you can experience if you don't use your sauna properly. Staying in too long or keeping the temperature too high can lead to heat stroke, when the body can no longer cool itself effectively. If you stop sweating while you're in your infrared sauna, it could mean heat stroke. Get out and rehydrate immediately and cool your body temperature down. Other symptoms of heat stroke include headache, nausea, dizziness and a rapid heartbeat. An infrared sauna is an excellent way to treat arthritis and other long term pain conditions and can contribute to the healing of many injuries, but there are exceptions. Some side effects, such as enhancement of bruises or inflammation of a sprain or strain, can be triggered if you use a sauna too soon after an injury has occurred. You should always wait at least 48 hours before using the sauna, otherwise swelling can increase. Infrared saunas bring pain relief and improved health to millions of people every year, but there are some conditions that don't respond well to the high temperatures and sweating that accompany sauna usage. If you have any kind of heart disease, diabetes, Parkinson's disease, hemophilia, cancer or MS, make sure to talk to your doctor to determine whether the benefits outweigh potential infrared sauna side effects that could cause a flare-up of your illness. In some situations, using a sauna can adversely affect the effectiveness of some medications. If you are taking any type of diuretic, barbiturates, or heart medications that could limit your body's ability to sweat or cool off properly, be sure you get your doctor's okay before using an infrared sauna. It's always a good idea to talk to your physician before using a sauna for the first time. 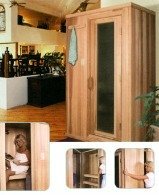 He or she can help you determine whether there are any infrared sauna side effects you need to be concerned about. Copyright © 2007-2015 Sauna Talk ~ All Rights Reserved Trademarks, brands and images are the property of their respective owners.